UPDATE 2000 GMT: Fighting appears to be ongoing in the Handarat camp, north of Aleppo, defying the earlier claim of the regime military that it had established full control. Rebels say they have regained most of the camp. Pro-Assad militia deny they have been pushed back. UPDATE 1145 GMT: The Syrian military is claiming full control over the Handarat camp, north of Aleppo. Pro-Assad forces have tried for months to seize the position, near the vital al-Castello road that was finally captured in July. The advance consolidates the siege of opposition areas of Aleppo, cutting off supplies along the main route north of the city. ORIGINAL ENTRY: Almost 100 people were killed in and near Syria’s largest city Aleppo on Friday, in the most intense pro-Assad bombing in months. 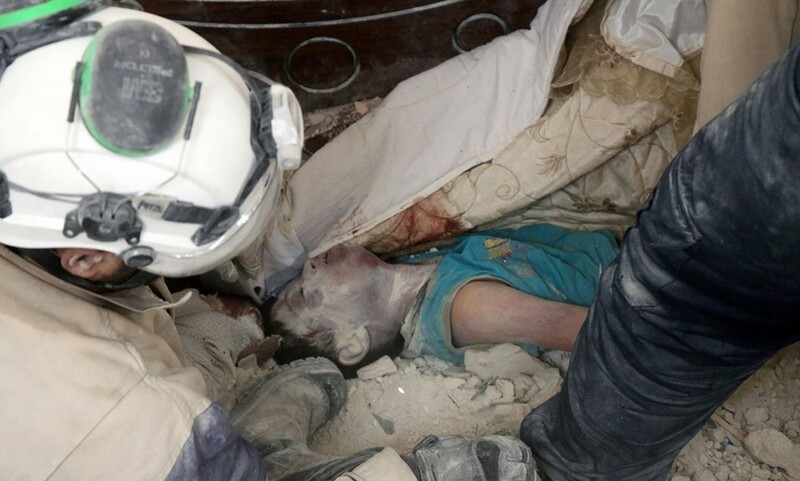 The White Helmets civil defense organization said 97 people had died, and at least 40 buildings destroyed. The Local Coordination Committee documented 94 fatalities, including 23 children and 9 women. Among the targets were White Helmets centers, with three of the four in the city struck and two put out of service. One rescuer was killed. The attacks reportedly included incendiary bombs, designed to start fires which are hard to extinguish. He noted that the attacking warplanes were Russian, despite Moscow’s supposed commitment to restore a short-lived ceasefire. 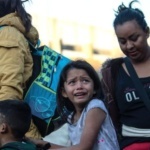 With the strikes damaging a pumping station, water was cut off to almost two million people in both opposition and regime areas of the city, according to the UN’s agency for children, UNICEF. The ceasefire was ended on Monday by the Syrian military. Hours later, Russian and regime strike aircraft and helicopters attacked a UN aid convoy, an incident witnessed by al-Selmo. Since then, the pro-Assad bombing of Aleppo city has been renewed, in its most intense phase since early 2016. More than 50 people were killed on Thursday in near-constant raids before Friday’s assault. 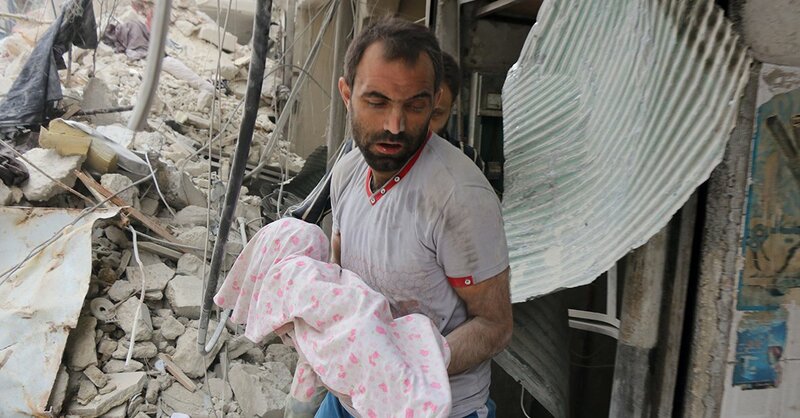 Video showed rescuers retrieving bodies and, in a rare moment of hope amid the carnage, saving a baby from the rubble. US Secretary of State John Kerry and Russian Foreign Minister Sergei Lavrov met briefly on Friday but there was no sign of any progress from the meeting. Lavrov has supported the Assad regime’s rejection of a demand by Kerry, made on Wednesday at the UN Security Council, that Russian and regime warplanes cease flights over areas of humanitarian needs. The refusal or inability to do that under the current circumstances cannot but strengthen suspicion that some wants to protect Jabhat al-Nusra and the regime change plans still exist, which is the grossest violation of the UN Security Council resolution. Kerry has not publicly responded to the rejection of his call to stop the aerial attacks. Guernica was a small Spanish village destroyed by German warplanes in April 1937. Commemorated in a painting by Pablo Picasso, the incident is a symbol for international inaction in the face of the mass killing of civilians. 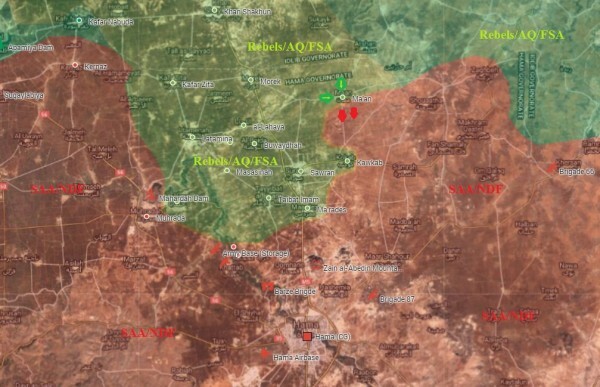 Activists reports that rebels have made a significant advance in their advance in northern Hama Province, capturing the heavily-fortified village of Ma’an. After quickly taking a series of towns and villages last month in the offensive, moving within 10 km (6 miles) of Ma’an, rebels had been checked at the start of September — partly by the defenses built up in Ma’an since 2014, partly by the US-Russian ceasefire. The pro-opposition STEP News Agency claims rebels destroyed three tanks near the village. Today’s news was unexpected, as there had been no notice of a renewed rebel attempt to move into Ma’an.